The emotion of sadness is a signal that you have experienced a loss. Learn to quickly and accurately recognize the emotion of sadness and use the energy it generates to help you take the appropriate action and move through grief recovery at a pace that is right for you. In general, appropriately grieving loss episodes in your own life can increase the likelihood that you can truly help others deal and grieve effectively with their losses. 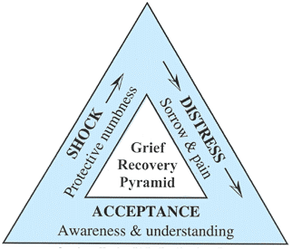 Remember that you may circle back and forth or around the Grief Recovery Pyramid during the recovering process.